While in Nairobi last week, I found myself staying in sort of a "dodgy" part of town. I mean, I never saw anything bad going down, but I heard stories. Anyways, it was a part of town where it really was prudent to have a night watchman and a guard dog, which this guesthouse had. 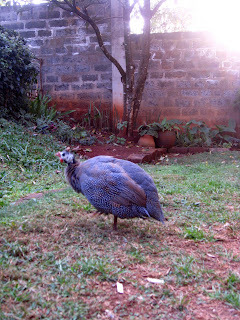 But the guesthouse also had a guinea fowl guard bird, and the crazy thing is that it's actually really good at it's job. It makes a sound much like that of Kevin the rainbow bird in the film "Up" - you know, like a cawing and cackling all at the same time. 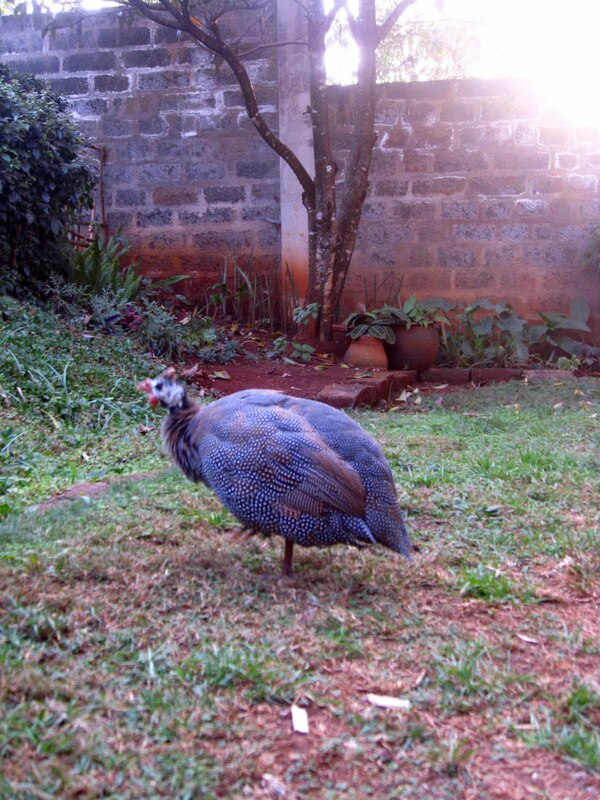 Evidently this guinea fowl will cause a downright ruckus if anything unfamiliar and scary gets into its yard. The time an ambitious mongoose got into the yard, this birdy cornered it in a storm drain and wouldn't quit screaming until someone picked him up and set him aside so they could net the mongoose. I've got no idea what a human intruder would do to a guinea fowl if the bird tried to corner them in a storm drain, but I'm sure it would startle the living daylights out of the person and create a diversion so residents could call the cops. Claire, that Guinea bird you described is a scream (literally). I love your pictures. Do you take them? That would be so funny if that bird did catch an intrude and trap him in a drain while he screamed bloody murder. You are sure seeing and observing some interesting things.